Normal superphosphate or single superphosphate (NSP, SSP) is used solely as a fertilizer material. NSP can be used with most crops and is applied during the planting season. NSP is a solid phosphate fertilizer material that is produced from phosphate rock and sulfuric acid (H2SO4). Concentrated or triple superphosphate (CSP, TSP) is used exclusively as a fertilizer material. TSP is a solid single-nutrient phosphate fertilizer material produced from phosphate rock and phosphoric acid. TSP typically contains 44–46% anhydrous phosphoric acid (P2O5), more than twice the P2O5 content of normal superphosphate. It is applied mainly in areas where plants are grown in soils that have a low concentration of phosphorus, which is important for root development. There has been an ongoing, slow change in the pattern of phosphate fertilizer consumption, away from NSP toward higher-analysis fertilizers such as mono- and diammonium phosphate (MAP and DAP) and TSP. Normal superphosphate (NSP), the lowest-analysis major phosphate fertilizer material and crudest with regard to its physical properties, lost its top ranking to ammonium phosphates during the mid-twentieth century. The largest consumer of NSP in 2017 is Central and South America, followed by China and Southwest Asia. 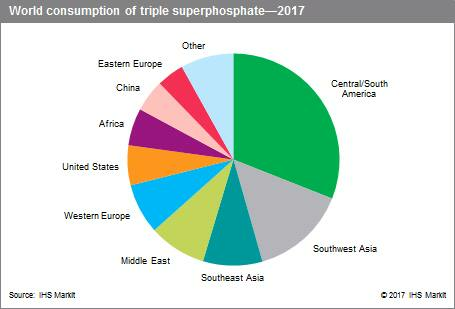 The world market for NSP contracted by about 5% per year between 2012 and 2017 and future growth will be minimal, as it continues to lose market share to higher-analysis phosphates. NSP has a relatively low nutrient analysis and generally poor physical properties; thus, its large-scale use tends to be restricted to developing regions that have phosphate rock resources that are not particularly suitable feed for the more sophisticated chemical processes involved in producing phosphoric acid and ammonium phosphate. The largest consumer of TSP in 2017 is Central and South America, followed by Southwest Asia, Southeast Asia and the Middle East. The world market for TSP contracted by about 1–2% per year between 2012 and 2017, and future growth will be moderate (2–3% per year). 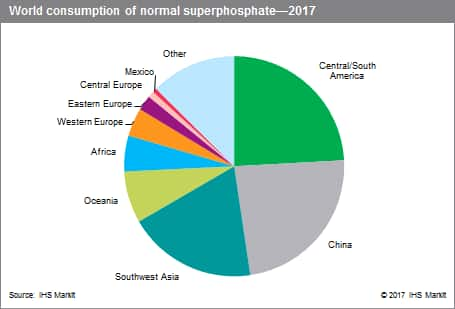 TSP has also been losing market share to ammonium phosphates, which have accounted for essentially all of the growth in world phosphate fertilizer consumption for many years. Although TSP has a similar phosphate analysis to ammonium phosphates, it contains no other nutrients, while ammonium phosphates also contain a significant amount of nitrogen, the most commonly used nutrient. Thus, the transportation cost per unit of total nutrient is higher for TSP than for ammonium phosphates, but still lower than that for NSP. The outlook for phosphate fertilizers to the year 2022 is for a growing agricultural market. After farmers reduced applications of phosphorus and potassium fertilizers in the past two fertilizer seasons, phosphate fertilizer demand is expected to grow moderately in the next few years. However, NSP will benefit to only a limited extent, with growth of only about 0.3% annually to 2022. Except for Central and South America, almost no new production capacity for NSP has been announced for the forecast period. Furthermore, NSP production capacity in China is expected to continue to decline.